Kreative Jewels: Oh Happy Day! Thank you for joining me as we count down to the MFT release. We are five days away from the big day! All the new Stamps, Die-namics, and Stencils will be available on Tuesday, March 7 at 9:00 pm EST. Be sure to check out the MFT Blog to see all the new items being revealed today. Don't forget to leave a comment on the MFT Blog countdown posts, YOU could win one of the five $75.00 gift vouchers. We have a seriously cute new pig set for you this month. Sow Much Cuteness is sure to wiggle it's way into your heart. Just look at how happy that little guy is? I stamped this little cutie on a piece of X-Press It card stock and I coloured him with Copics. I used the fabulous new Blueprints 31 to die-cut the stitched rounded oval. I'm loving this new set of Blueprints! You colored this piggy perfectly. I love that grid paper too!! 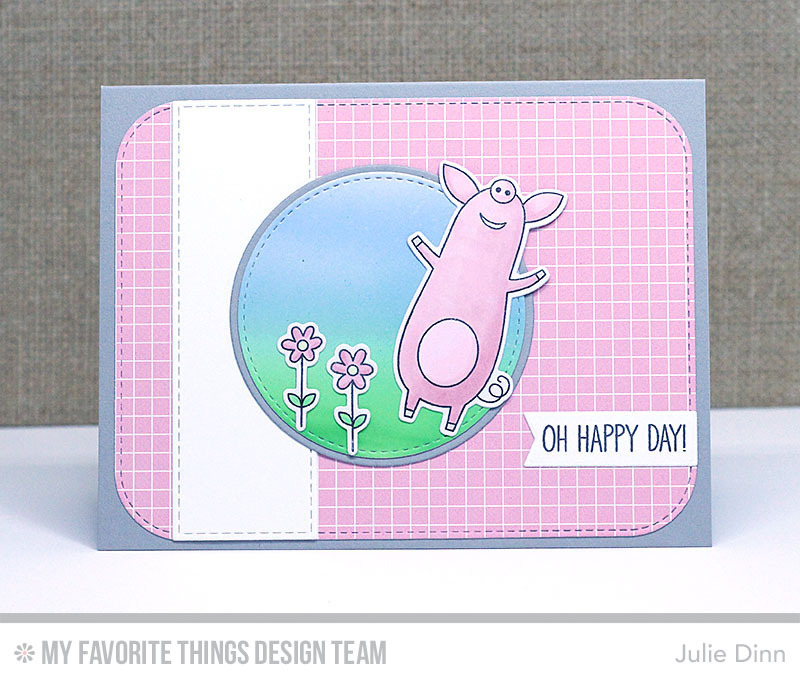 Love the pig and the card is so colorful. Thanks for a chance to win goodies! Your happy pig made my day! So Adorable! Love the soft, monochromatic color theme! Great card! Your layering and color coordination throughout the card bring it all together so well. Thanks for sharing this. Julie, I love the pink and blue and the shading you did on this card! The little piggie does look like it is having a happy day! Thanks for sharing. Such a happy card! Love that little happy piggy.